We're kicking off the Christmas in July blog hop with a tutorial to make an advent calendar using Nancy Halvorsen's Ho-Ho-Ho, Let It Snow collection! Sometimes the fun of a panel is cutting it apart and using different sections to enhance a simple idea. 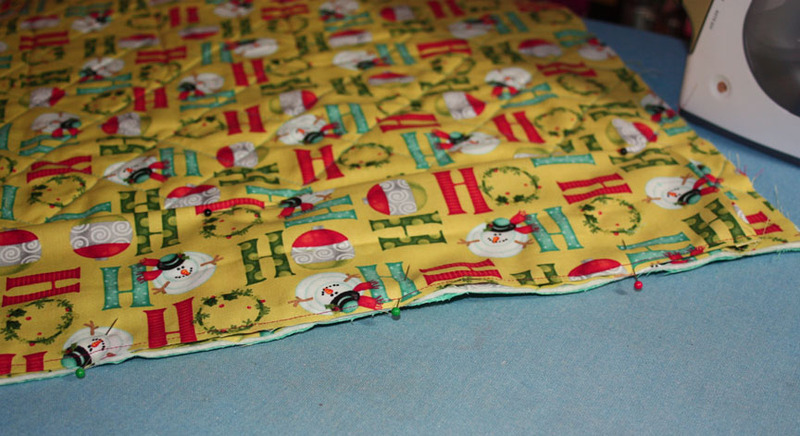 Here, the panel sections alternate with rows of pockets ready to be filled with advent goodies. From the dark teal print, cut (2) 1-3/8'' x 8-1/2'' pieces and (2) 1-1/2'' x 13-1/2'' pieces. 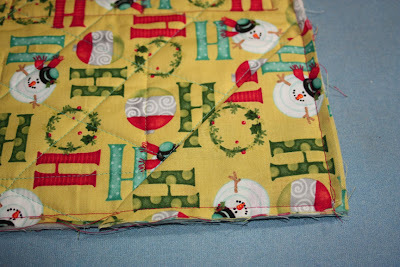 Sew the short pieces to the sides of the ''Merry Christmas'' panel section and the long pieces to the top and bottom. From the dark teal print, cut (2) 7/8'' x 9'' pieces and (2) 1-1/4'' x 6-1/2'' pieces. Sew the long pieces to the sides of the ''Joy'' panel section and the short pieces to the top and bottom. 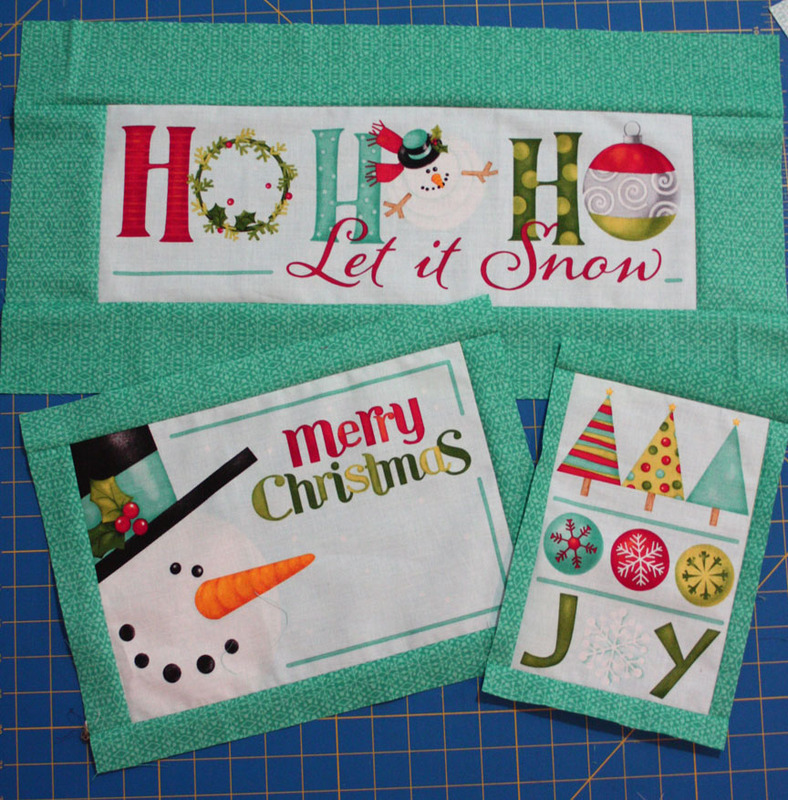 From the light teal print, cut a 10-1/2'' x 22-1/2'' strip, a 9-1/2'' x 10-1/2'' piece and a 10-1/2'' x 16'' piece. Sew the 10-1/2'' x 22-1/2'' light teal strip to the bottom of the ''Ho Ho Ho'' panel. 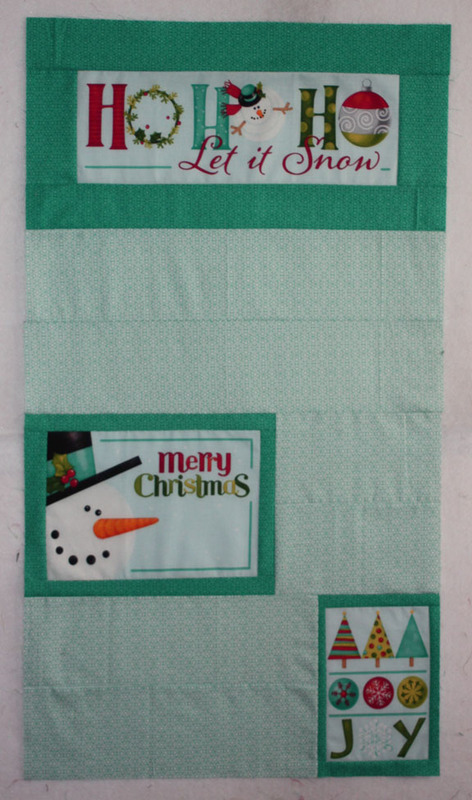 Sew the 9-1/2'' x 10-1/2'' light teal piece to the right side of the ''Merry Christmas'' panel. Sew the 10-1/2'' x 16'' piece to the left side of the ''Joy'' panel. Join the three sections together. 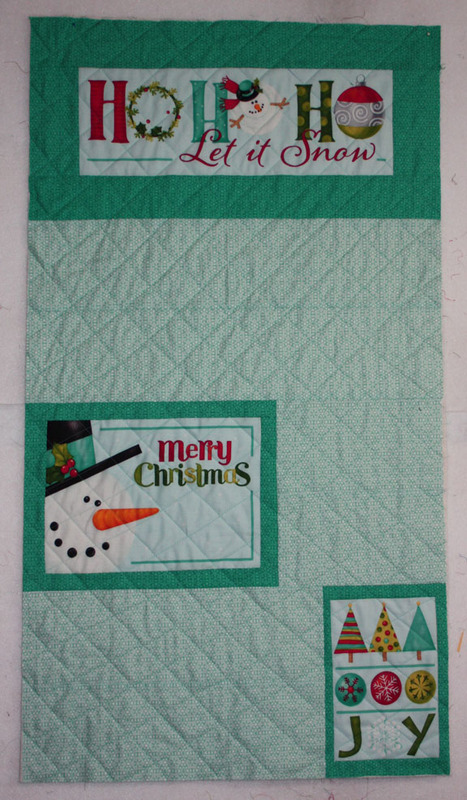 Layer the calendar top with batting and backing and quilt as desired. I used a 2''-wide diagonal crosshatch pattern. 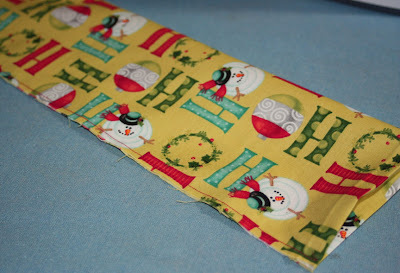 Reserve the remainder of the backing fabric to create the hanging sleeve. From each of the red stripe and green stripe, cut a 7-1/2'' x 21-1/2'' piece, a 7-1/2'' x 14-1/2'' piece, and a 7-1/2'' square. 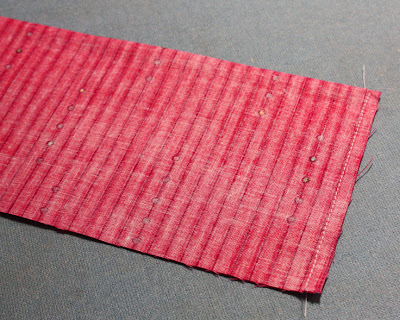 Fold a 7-1/2'' x 21-1/2'' red stripe piece in half lengthwise, right sides together. 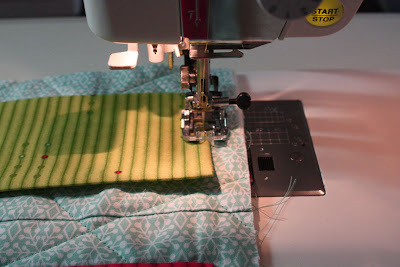 Stitch both short sides using a scant ¼'' seam allowance. Turn right side out and press. Repeat with remaining stripe pieces. Measure 5-3/4'' up from the top of the ''Merry Christmas'' dark teal border and draw a horizontal line. Position the raw edge of the longest red stripe piece on the line (shown in white below), with the rest of the red piece below. Pin in place and stitch, using a ¼'' seam allowance and backstitching at both ends. Press the red flap up and pin in place. Mark lines every 3-1/2'' along the red strip. 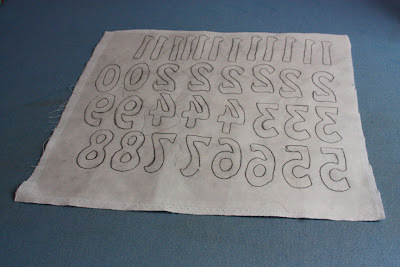 Topstitch on each line, as well as along both short ends, backstitching at each end. 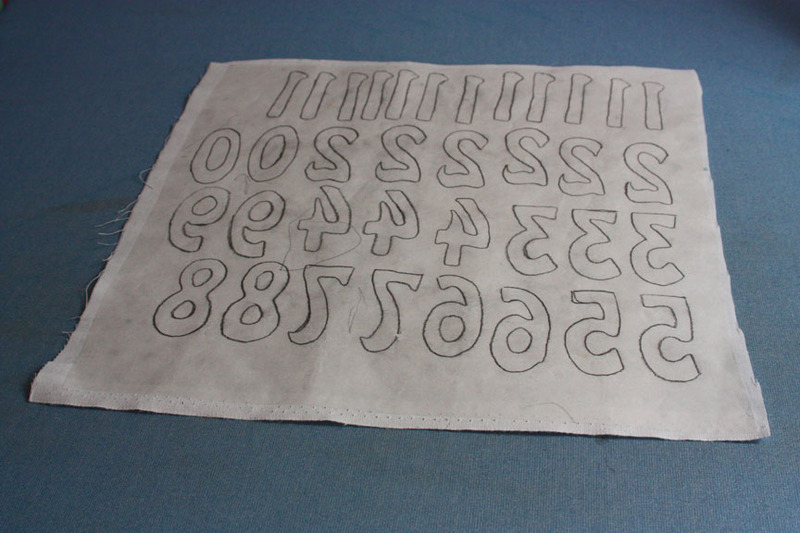 Repeat with the remaining strips as shown, using the following measurements to draw the positioning line. 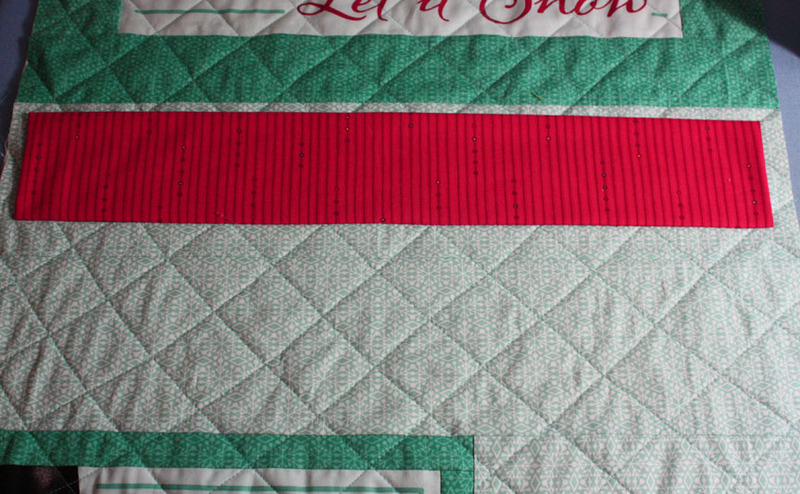 Long green stripe piece: 1-1/4'' up from top of the ''Merry Christmas'' dark teal border. Short red stripe piece: 6-1/4'' up from the top of the ''Joy'' dark teal border. 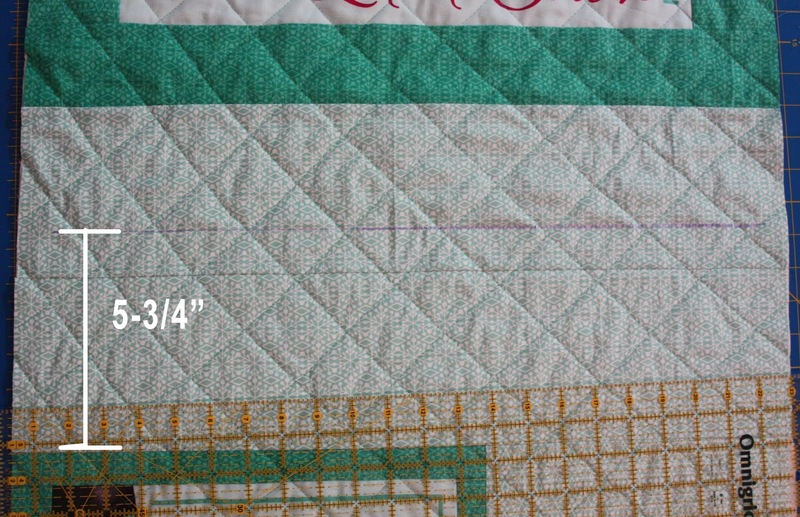 Short green stripe piece: 1-1/4'' up from the top of the ''Joy'' dark teal border. Medium red stripe piece: 5-3/4'' up from bottom edge of quilt top. 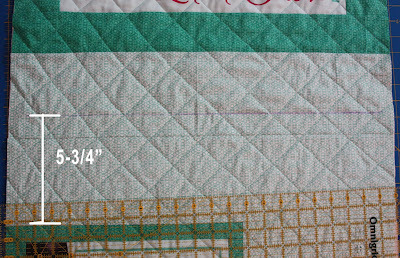 Medium green stripe piece: 1-1/4'' up from bottom edge of quilt top. Following the manufacturer's directions, fuse to the wrong side of the dot on white print. Cut out each number. 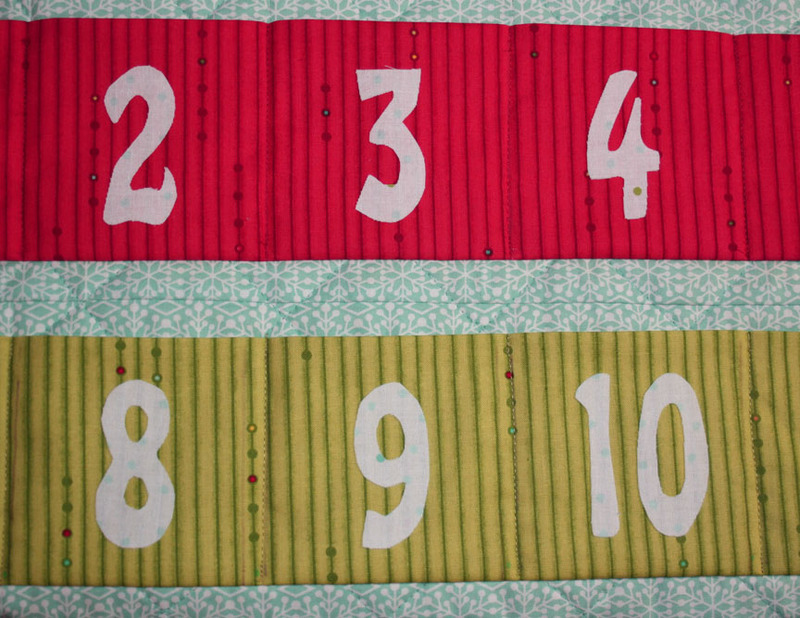 Fuse the correct number onto the center of each pocket. You can measure if you like, but I just eyeballed it. From the remaining backing fabric, cut an 8'' x 20'' piece. Press each short end in ½'', wrong sides together. Fold the piece in half lengthwise, wrong sides together. Stitch down the long edge. Pin to the back of the advent calendar, matching the raw edges of the sleeve with the top raw edges of the calendar. Cut (2) 5'' squares from the remaining backing fabric. Fold each in half on the diagonal, wrong sides together. 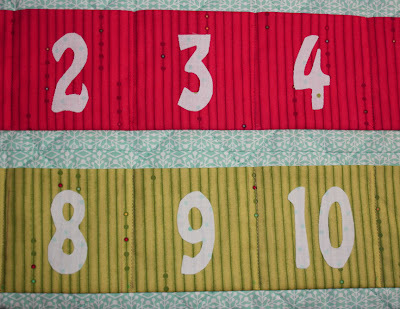 Position on the back of the advent calendar in the bottom two corners, matching raw edges, and pin in place. Cut (4) 2-1/2'' x 42'' wavy stripe strips for binding. 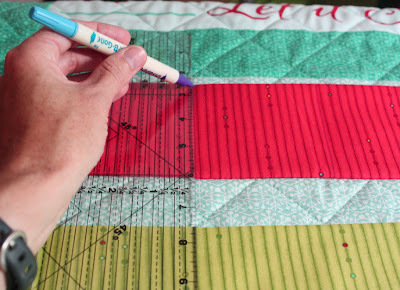 Bind the quilt, catching the raw edges of the sleeve and triangles as you stitch. Blindstitch the bottom edge of the sleeve to the quilt back so it lays flat. Hand stitch coordinating buttons onto the panel sections. 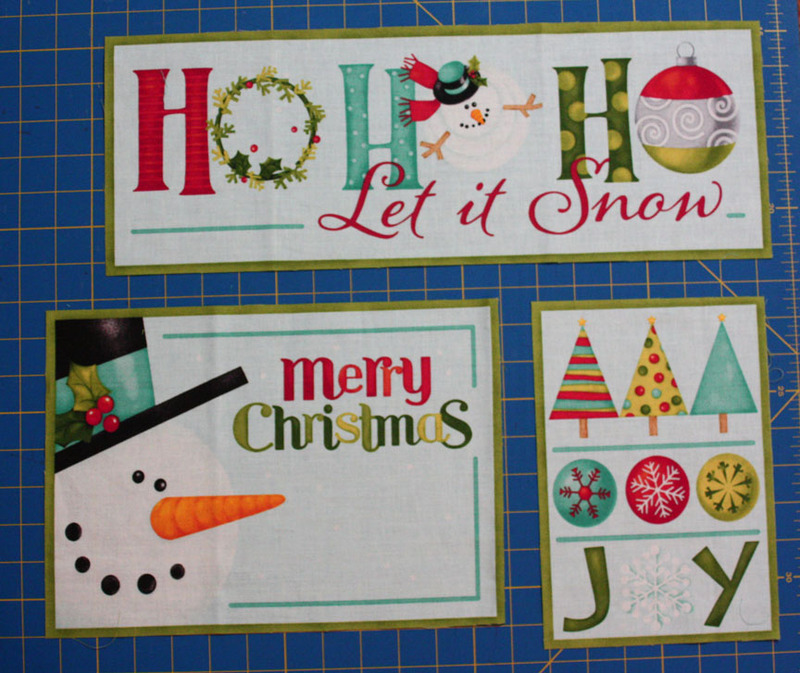 We're giving you the opportunity to win a fat quarter bundle of the Ho-Ho-Ho, Let It Snow collection! The contest is open through Tuesday, July 31st at 11:59 pm EST. All you have to do is sign up to follow our blog (see Bloglovin' and email options in the righthand sidebar) and leave a comment letting us know you are doing so. For a second entry, like us on Facebook and leave a comment letting us know you are doing so. Good luck! And be sure to stop back here each day through the end of July to see more holiday tutorials! Plus, join our Christmas cookie recipe exchange on Facebook! What an adorable idea. I have just ordered two panels of this print to make some for the grandkids. Thanks!! I "do" Nancy Halvorsen...a lot!, love her fabrics!!! 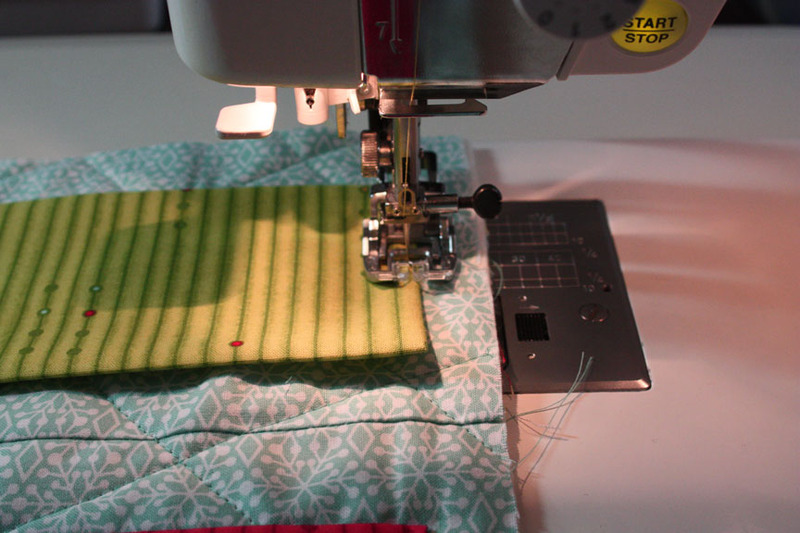 I do follow your blog, have for quite some time and enjoy it "sew" much! Have been a follower on Facebook for a long time! I also have your new app downloaded on my iPad for quick viewing anytime I'm away from my main computer. I just love Benartex and enjoy the blog very much. 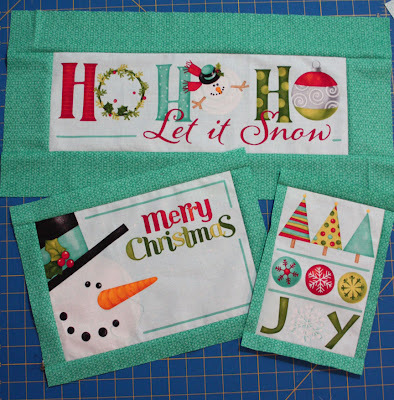 Your Ho Ho Ho Blog Hop is going to be so much fun with all of the creative tutorials coming our way. I did leave a comment on FB and always look forward to my visits with you. Thank you for all that you do for all of us, your followers. Very cute! I follow your blog via GFC. 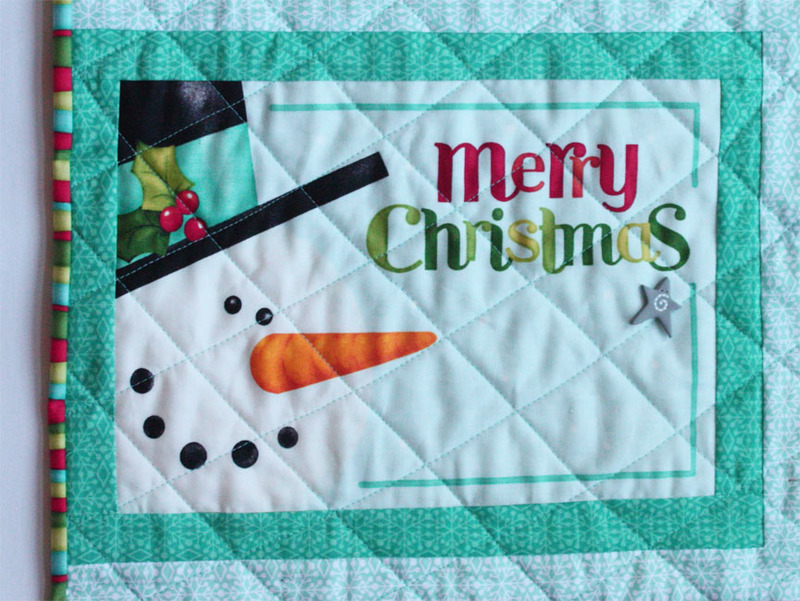 Panels make such fun Christmas projects! I am a follower--thanks for the chance to win some cute fabrics! Super cute and I follow by email. Cute advent calendar. I follow you by email. Great tutorial for this line. My Grandkids will love the Advent Calendar. I follow on FB as well as by newsletter. What wonderful eye candy! Thanks for the giveaway. I follow this blog via email. I'm a follower and receive your posts via email and bloglovin. I like the tutorial on this post. Thanks. So cute! I'm following you on Bloglovin. Have already been following you. Cute tutorial! Thanks! I love the wall hanging and I have been following. liked you on FB, thanks for the giveaway. I follow the blog and Benartex on Facebook. 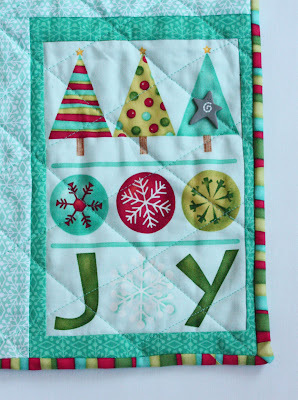 Super cute.Happy Christmas in July and thanks for the tutorial!. I do follow by email. I also follow by email. Thanks for the chance to win. I follow via email, my preferred method! Love this line! Great for the grandkids! I follow this on facebook! how cute is that! I get your blog posts straight to my email. I really like the calendar! I follow on Facebook and email already. This is getting me in the mood for Christmas - a little early! I love this and am a happy follower by email and on bloglovin! Thanks for the tutorial. I'm following with Bloglovin'. Liking you on FB. Thanks again. Thanks for the tutorial. I already follow your blog via email. I am already following the blog via email and I have just now added you to my BlogLovin' list too. I follow you with Bloglovin. Thanks for the tutorial and the giveaway. Thats a cute advent calender! And darling fabric. I am a follower. I follow your blog and receive the newsletter. I also allready like dand follow your Facebook page too. Thank you for the chance to enter. This is such a gorgeous fabric line. Love your take on the advent calendar, so creative! I follow you on bloglovin. I'm a longtime follower on Fabebook. I'm also a follower on Facebook. Thanks for the chance to win! Follow on facebook! Good luck to us all! I am now following your blog via bloglovin. I love that panel. So cute and such a wonderful Advent calendar. I follow you through email. Love the panel and the entire fabric line. I'm a new follower via email. I'm a new follower via Bloglovin'. Thanks for the chance on this lovely fabric. I am a new follower on Bloglovin' I love snowmen! I decorate with snowmen for the holidays and keep them up for most of the winter. Thank you! Very sweet and I follow on Bloglovin. I already follow on Facebook. Good luck for me. I follow by email. What a cute Christmas idea! Very cute! Love all the buttons to add a special decorative touch! 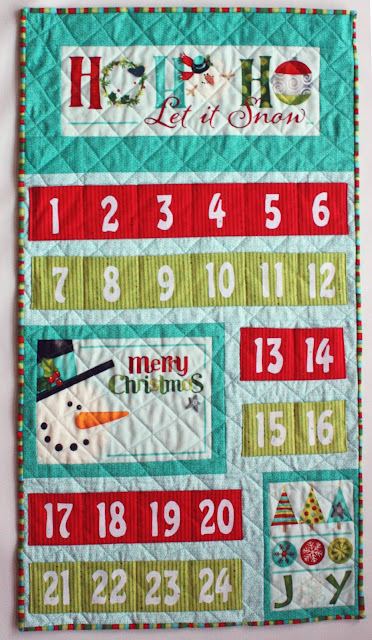 My daughter would like me to make this advent calendar! I'm following the blog on Bloglovin'. Can't wait to sit down and read some older posts to catch up on lots of good stuff! I like Benartex on Facebook, too. I also subscribed to you by e-mail. I am signed up by email. Love this fabric and the calendar. Thanks for the chance to win!